Whether you are looking for earrings for a wedding or a special event, or just wanting something fun to wear out for the evening, here is where to find it! Unless specifically marked otherwise, please assume that the earrings are pierced. From small and elegant to large and outrageous, we have buttons, dangles, chandeliers, hoops, and more. 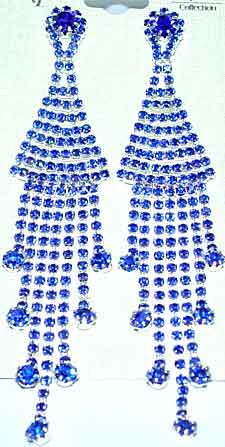 Materials include cubic zirconia, rhinestones, lucite stones, glass and freshwater pearls, crystals and beads. Enjoy! If you are needing multiples (for example, for bridesmaids for a wedding) please let us know and I can find out if the needed number is available. We normally do not stock more than one or two of any particular style but can often obtain what you need by special order. Please remember, special order items are not returnable, and occasionally a special order fee to pay for shipping from the manufacturer may be necessary on smaller orders. 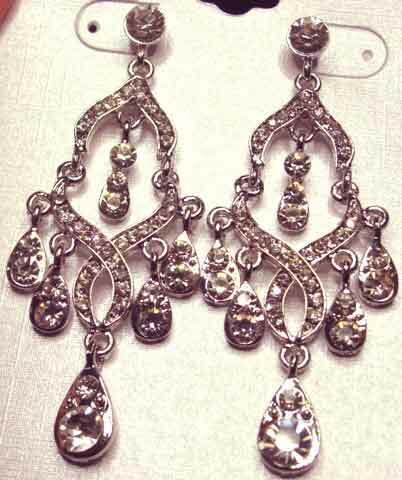 Description: Clear Rhinestone Chandelier Earrings - Silvertone setting, 2 3/4" x 1 1/8". Pierced (post) findings. Much brighter in person. Great price! 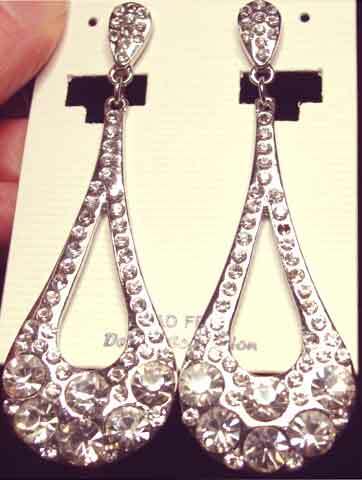 Description: Clear Rhinestone Open Teardrop Shaped Earrings - Silvertone setting, 2 3/4" x 7/8". Paste set round clears in different sizes. Very sparkly. Open design makes them look more "airy" that most this size. Pierced (post). Wonderful price! 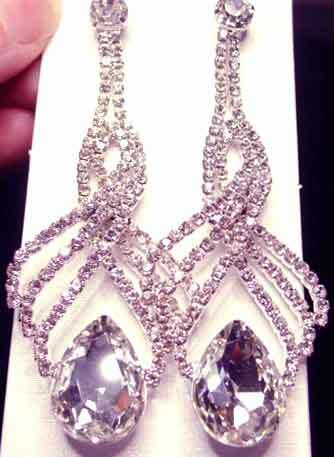 Description: Clear Swirly Rhinestone Earrings with Large Pear at Bottom - At 3" x a little over 1", these are perfect for pageant or anytime you want a blingy look. Silvertone setting, pierced (post). 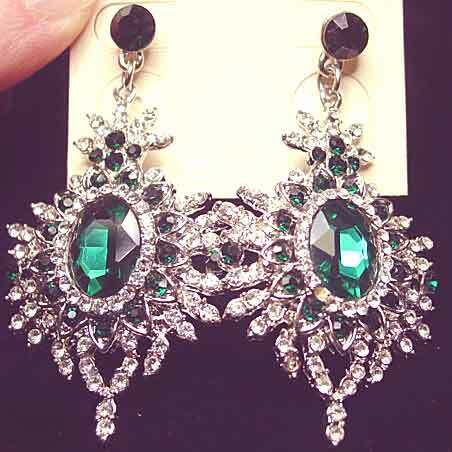 Description: Emerald Green and Clear Rhinestone Dangle Earrings - Spectacular earrings featuring a central green oval, surrounded by clears and green rounds in a stylized sunburst design. Silvertone setting, pierced (post). 2 1/2" x 1 1/4". Perfect with black or white, or perhaps these will be your Christmas go-to party earrings. Description: Mint Green/Peridot Green/Clear Rhinestone Earrings - The translucent stones in these earrings are sometimes called "green opal", but spring green may be more accurate. 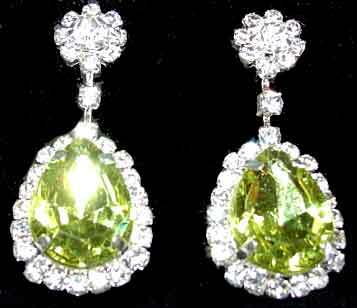 These alternate with light lime green rhinestones and a few clear round rhinestone complete the design. 1 3/4" x 3/4", light goldtone setting, pierced (post). Very pretty and not an easy to find color. 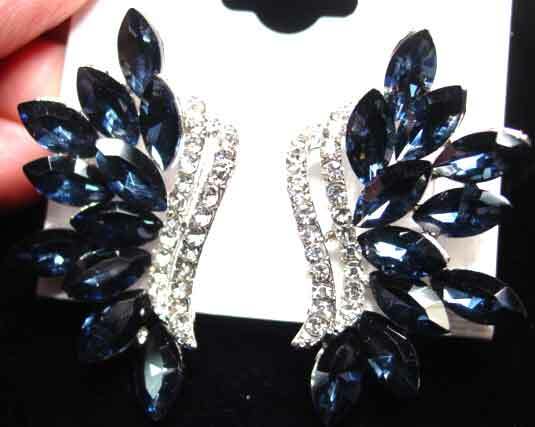 Description: Montana Blue and Clear Rhinestone Swirl Earrings - Beautiful dark blue pears and marquises with paste set clear rounds. These would go well with either dark blue or navy blue. 2 1/4" x 5/8" at widest point. Silvertone, pierced (post). Fantastic price. 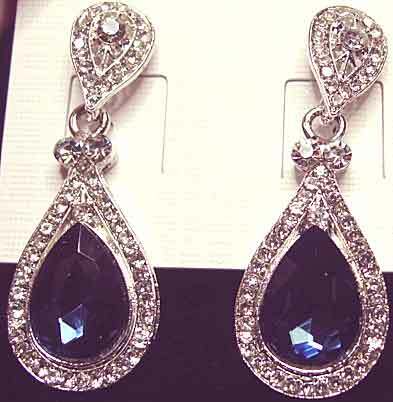 Description: Montana Pear and Clear Rhinestone Earrings - Showy, pageant type earrings using teardrop shaped dark blue stones surrounded by small clear rhinestones. These are articulated (jointed) for maximum sparkle and flexibility. Goldtone setting, pierced (post), 3 3/4" x 1" at widest point. A great price for these earrings ! 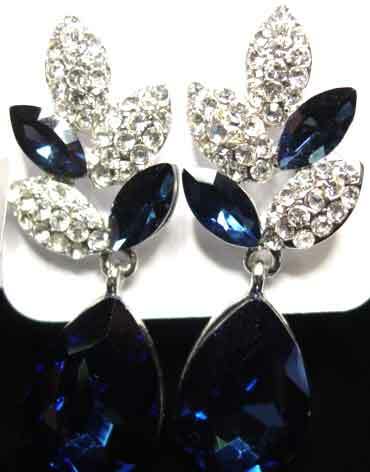 Description: Montana Blue Marquises and Clear Rhinestone Earrings - A more "compact" look for a special occasion earring, with clear rhinestone lines from which the dark blue navettes radiate. Silvertone setting, pierced (post), not quite 1 3/4" from tip to tip, 7/8" wide. 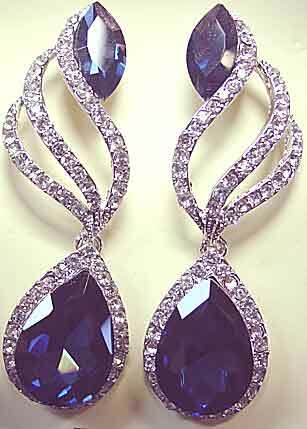 Description: Montana Blue Pear and Marquises with Pave Leaves Earrings - Silvertone setting, pierced (post), 1 3/4" x 5/8". Perfect with most dark blue clothing. Description: Montana Blue Pear and Clear Rhinestone Earrings - If your taste runs to the more conservative, this smaller, elegant style with many tiny clear stones should be perfect. 1 5/8" x 5/8" at widest point. Silvertone, pierced (post). 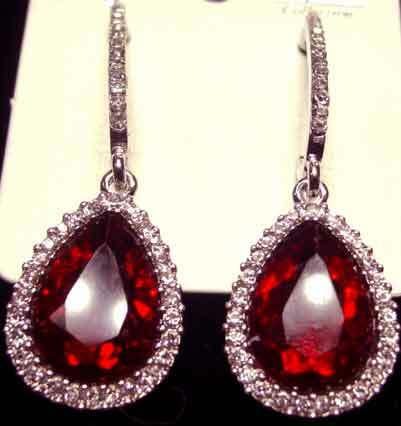 Description: Red Pears with Clear Rhinestones Earrings - A variation on a doorknocker style hoop, these use a single large red pear surrounded by clear rhinestones, with additional clears running on the vertical demi-hoop. Silvertone, pierced (post), 2" x about 5/8" at widest point. Great price! Description: Sassy South Clear Rhinestone Earrings in Goldtone - We have had this design in silvertone/AB, here it is in goldtone with all clear stones. 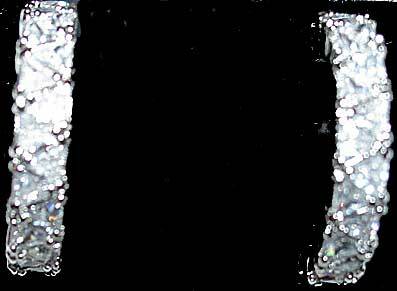 Very sparkly, pierced (post), open design with various sizes of round rhinestones. 3 3/4" x 3/4" at widest point. Great for pageant, prom, wedding. Description: Aurora Borealis Pears and Triple Marquises Earrings - Goldtone setting, this features a large AB pear stone surrounded by small clears, which is suspended from a top of three marquises and a single round. 2 1/4" x 7/8" at widest point. Pierced (post). Description: Aurora Borealis Pears and Skinny Navettes Dangle Earrings - In goldtone, single large pears have a "crown" of clear rhinestones, suspended from a top of three "skinny" navettes (marquises) and two standard size marquises. Pierced (post), 2 3/8" x 3/4". Description: Aurora Borealis Pear, Marquise, and Pave Leaf Earrings - In goldtone, these earrings are smaller than they might appear in the photo - 1 7/8" x 5/8", and quite elegant. Pierced (post). The paved leaves use clear rhinestones, and the bottom section is jointed in the center for greater movement and sparkle. Hypo allergenic. 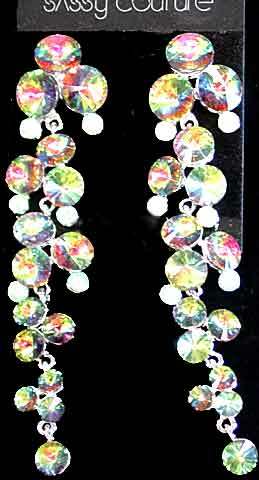 Description: Tapering Aurora Borealis and Clear Rhinestone Earrings - Silvertone setting, pierced (post). These use mostly clear stones, with the largest stones being aurora borealis, giving these earrings a very "white" effect for an AB earring. 3" long, 1" at widest point. The use of many small stones and some cut out parts in the design keeps these feeling more delicate than an earring this size normally would. 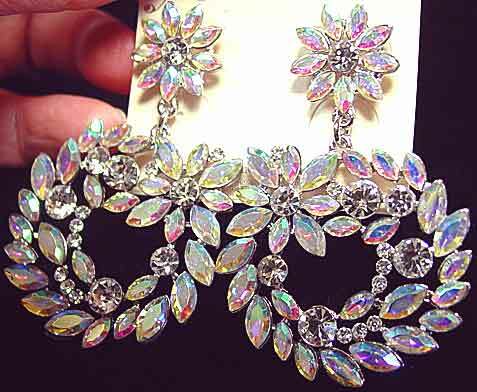 Description: Fun Aurora Borealis and Clear Rhinestone Doorknocker Hoop Earrings - Feminine and flirty, these floral motif earrings use small aurora borealis marquises and clear round rhinestones. Silvertone setting, pierced (post). 2 1/4" x about 1 1/2" diameter for the hoop. 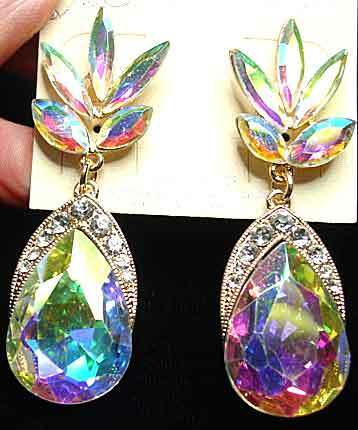 Description: Aurora Borealis Pave Open Teardrop Earrings - Silvertone, pierced (post). These are unusual in that all the stones are AB - usually pave is done in clear stones, so these are extra special. At 3" long and 1" at widest point, these are kept from looking overdone by using an open design and lots of small stones. Nickle free. Super price. 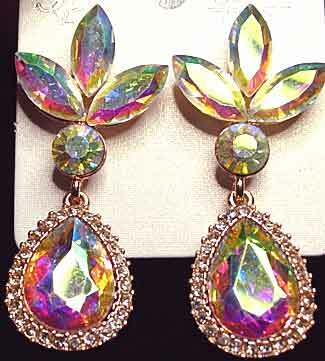 Description: Aurora Borealis/Clear Pear, Marquise, and Rivoli Earrings - Silvertone, pierced (post). These are very similar to OE2-855, except that these use a rivoli (pointed top) AB stone instead of the chaton round, and the clear stones that border the large pear are very slightly smaller than the other pair. 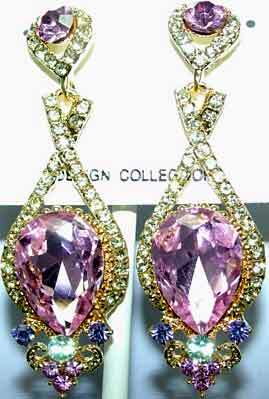 (These are also silvertone rather than goldtone, and the stones reflect more pink/purple). 2" x 7/8". 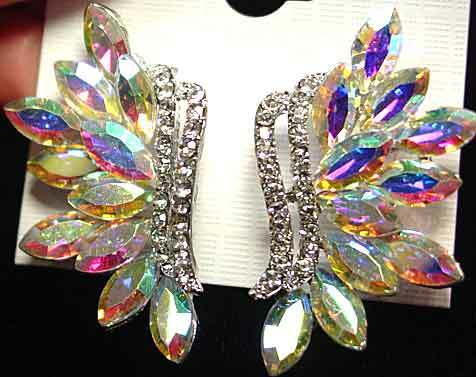 Description: Aurora Borealis/Clear Rhinestone "Wings" Earrings - Silvertone, pierced (post), these are a different colorization of OE1-847 using aurora borealis marquises. About 1 3/4" x 1". 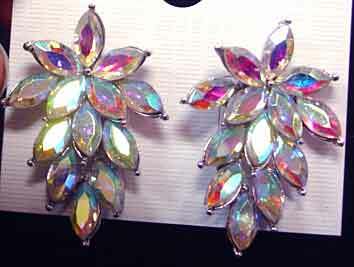 Description: Aurora Borealis Marquise Earrings - Silvertone, pierced (post). Compact floral motif design, 1 1/4" x 7/8" at widest point. An elegant, understated earring. Description: Aurora Borealis Marquises with Small Clears Earrings - This tapering design is jointed in 5 places for lots of flexibility and movement. Silvertone, pierced (post), it uses larger marquises at the top and gradually gets smaller the farther down you go, ending with another larger marquise. At 3 1/2" x 1 1/4" at widest point, these are made to be noticed. A great price for this much bling. 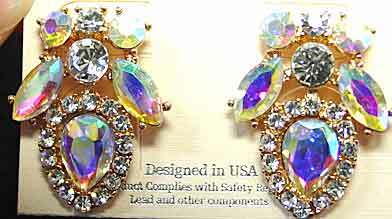 Description: Aurora Borealis and Clear Rhinestone Earrings - At 1" x 3/4", this is a more understated special occasion earring. 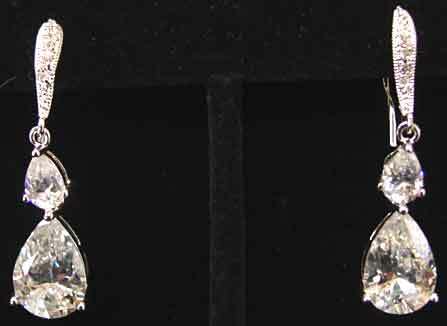 Single AB teardrops are surrounded with a border of clear rhinestones, while the top of the earring uses AB navettes and rounds, and clear rounds. Goldtone, pierced (post). Elegant. 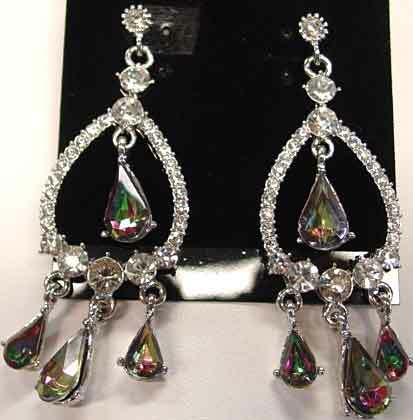 Description: Over the Top Glamour Aurora Borealis Marquises and Clear rhinestone Earrings - If you are channeling Marilyn Monroe, these are for you! 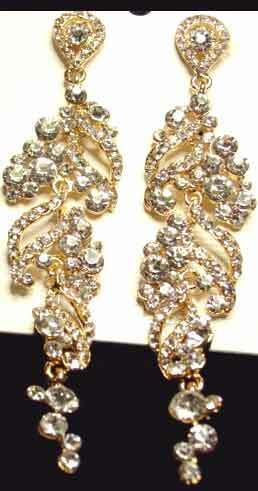 4" x 1 1/4" at the widest point, these tapering, jointed earrings would make any showgirl envious! 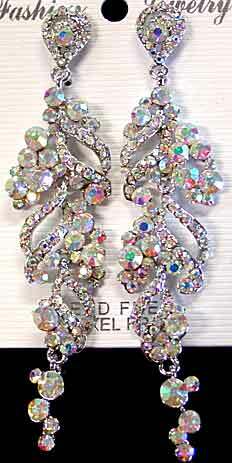 Aurora borealis marquises in different sizes are accented with a swirl of clear rhinestone pave. Silvertone, pierced (post). Wowsers! 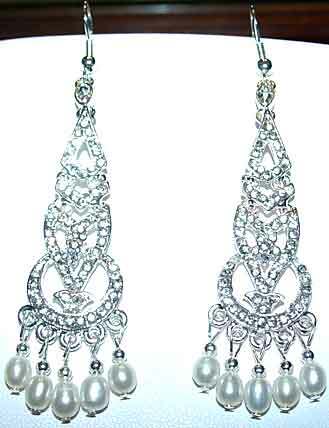 Description: Clear Rhinestone and Glass Pearl Oversized Doorknocker Earrings - Three rows of sparkling clear rhinestones form an elongated oval-teardrop shape with a cluster of 6mm white glass pearls in a 2-3-4-3-2 pattern at the bottom. 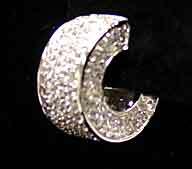 Top features a small teardrop shape centered with a single clear rhinestones and surrounded by a border of tiny clears. Silvertone, pierced (post), 2 1/2" x 1 1/8" at widest point. Perfect for a bride wanting a pair of earrings as a jewelry focal point that can be seen in distance photographs, particularly if you are wearing your hair down. Much nicer than photo indicates. 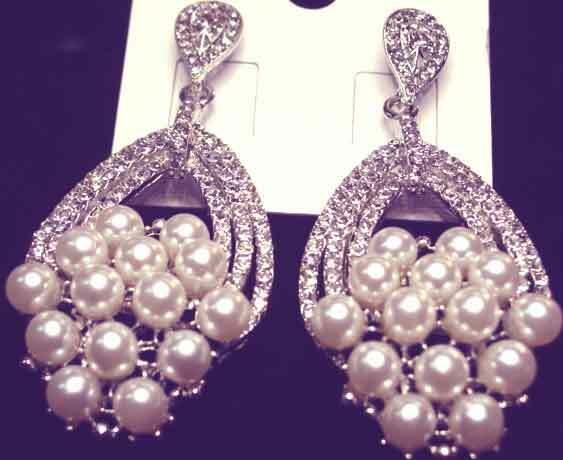 Description: Glass Pearl and Rhinestone Square Shaped Earrings - Actually these are positioned so that they are a diamond shape rather than like a square. Four white glass pearls alternate with small pave set clear ovals. 3/4" x 3/4", silvertone, pierced (post). 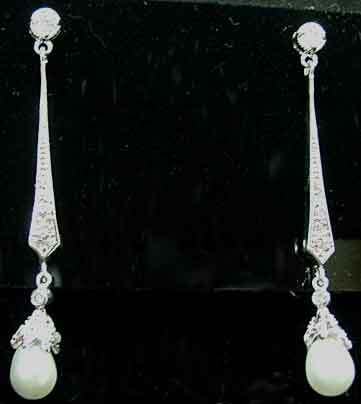 Description: Clear Rhinestone Open Teardrops with a Single Glass Pearl Dangle Earrings - Three concentric pear shapes surround a single 5mm white glass pearl dangle, all suspended from a small inverted teardrop shape done with two rows of rhinestones. Silvertone, pierced (post). 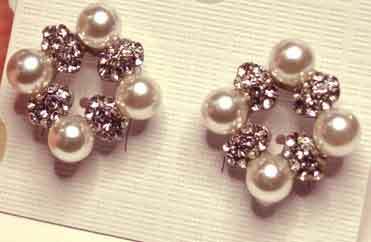 If you want mostly rhinestones with just a touch of pearl to tie in, these are for you. 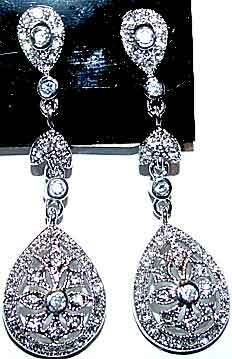 Description: 18th Century Look Clear Rhinestone Earrings - Antique looking dangling earrings done in all clear rhinestones in silvertone, pierced (post). Teardrop shaped bottom is done in a cut-out design using small pears and marquises and tiny rounds. This is surmounted by an open pave set half-loop topped with tiny marquises and another top section with a full loop and more tiny marquises. Center section is jointed on both ends for lots of motion. 3 1/8", 1" at the widest, tapering to about 3/8" at the top. If you've seen any movies about Marie Antoinette (there's a fairly contemporary one with Kirsten Dunst and a much older one with Norma Shearer), then these are stylistically very similar to the pieces seen there. Very feminine and delicate feeling, even at this size. 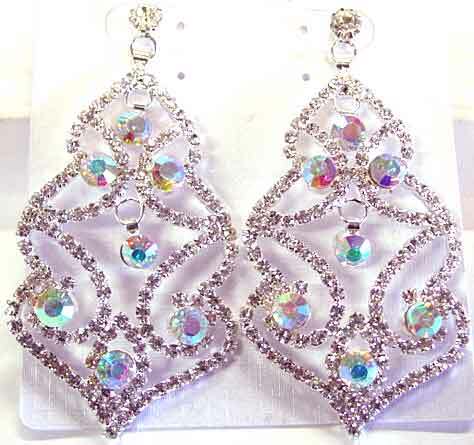 Description: Clear and Aurora Borealis Rhinestone Chandelier Earrings - A slightly different take on the basic chandelier design, with the larger stones in clear aurora borealis and the outlining all done in clear rhinestone chain. Silvertone setting, 3" x 1 3/8", post (pierced). Great price! 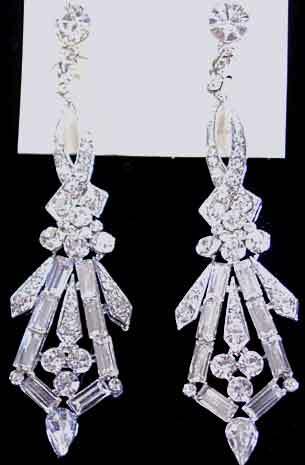 Description: Sassy South Deco Inspired Clear Rhinestone Earrings - If you love the look of 1930's glamour but don't want to buy the vintage earrings because they are usually screwback, here is a great alternative at a wonderful price. All clear rhinestones in round, baguette, and pear shapes make up this design. Silvertone setting, 3 1/4" long and 3/4" at widest point, pierced (post). 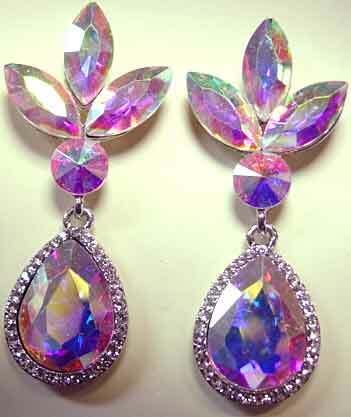 Description: Sassy Couture Vitrail Medium Waterfall Earrings - Often referred to as a "watermelon" stone because it flashes predominantly multi greens and fuchsia, I also see flashes of other colors, mostly dark blue and pink. The vitrail medium stones are rivoli cuts (round with a pointed, faceted top); the smallest rounds are actually lime aurora borealis (they look almost white in the picture, but are light green in person). Silvertone setting, 4 1/4" x 13/16" at widest point. Pierced (post). 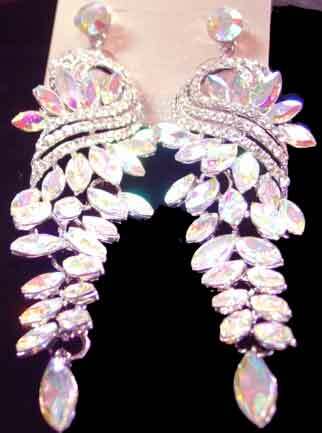 Description: Sassy South Long Dangling Aurora Borealis Rhinestone Earrings - Done with lots of smaller stones, this is a more delicate design, while still being large enough to be seen in photographs. Silvertone setting, pierced (post), these are 3 1/2" x 3/4" at widest point. Made in 5 sections for articulation and lots of sparkle. Aurora borealis (irridescent) stones will go with almost any color, terrific with pastels and neutrals, even certain jeweltones. Lead and nickel free. Description: Sassy Couture Aurora Borealis Pear and Rhinestone Ball Earrings - Two smaller AB pear stones top a third, larger, pear stone, with all connected by small rhinestone set balls. Silvertone, pierced (post), 3 1/2" x 3/4" at widest point. These really stand out in a crowd! 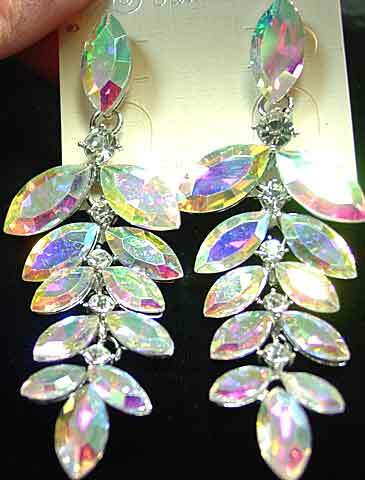 Description: Sassy Couture Aurora Borealis Waterfall Earrings - Done in both AB rivoli (pointed, faceted top) and round AB rhinestones, these measure 4 1/4" x 7/8" at widest point. Silvertone, pierced (post). You will enjoy these for years to come. 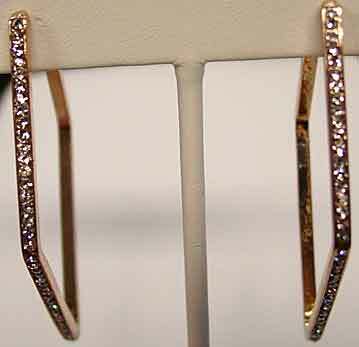 Description: Goldtone/Clear Rhinestone Diamond Shaped Hoop Earrings -If you are looking for a larger hoop but are tired of round, here is a new look - think of a rectangular shape at an angle. At less than 1/8" wide, these are slim and very modern looking; at 2 1/2" long and 1 3/4" wide, these are great hoops for people with any length hair, as these will be seen! Pierced. Description: Mariell Delicate Linear Cubic Zirconia Earrings - At 1 7/8" x 1/4" at the widest point, these lovely earrings are an excellent simulation of fine jewelry, with inverted pear tops from which suspend a jointed line of tiny rounds that end in a marquise. Pierced (post), goldtone setting, these will go from the most special of occasions to a candlelit dinner at home. Excellent price point for this kind of workmanship. 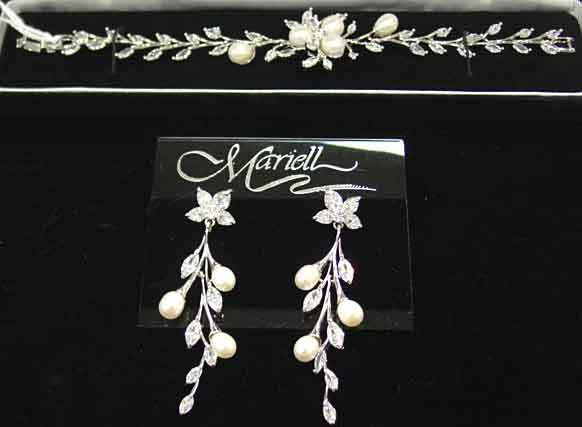 Description: Mariell Glass Pearl and Rhinestone Dangle Earrings - Silvertone elonated cones end with a pave set strip atop a white 12mm glass pearl, and suspended from a single clear rhinestone. 1 3/4" long, pierced (post). Very sleek and elegant. 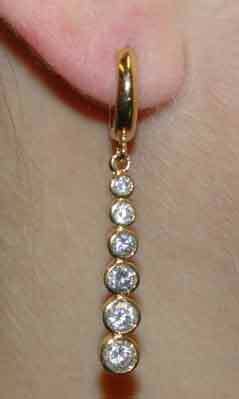 Description: Mariell Oval Cubic Zirconia Dangle Earrings - Three different sizes of oval CZ's are used in these lovely earrings - a medium sized 5 x 7mm at the top, a tiny 3 x 4mm at the center, and an 8x10mm at the bottom, surrounded by a border of small rounds. About 1 7/8" total length, 7/16" at widest point. Slender and elegant. 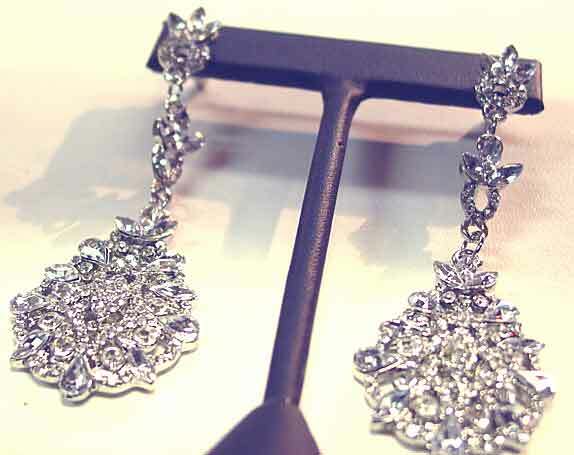 Description: Mariell Filigree and Cubic Zirconia Earrings - If you are a fan of Downton Abbey or simply a lover of early 20th century style, these fantastic earrings will make your heart go pitty-pat. 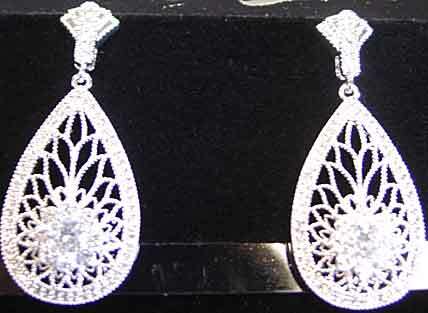 The filigree teardrop shapes are bordered with a paved line of tiny clear CZs, and the bottom center is a floral shape done with a larger center round surrounded by 8 slightly smaller rounds. The deco-influenced top is also set with small round CZs. 1 3/4" x 3/4", rhodium plated silvertone. Pierced (post). 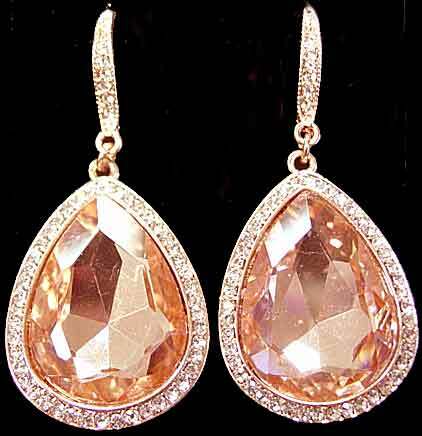 Description: Intense Peach Pear Drop Earrings - Unfortunately my picture doesn't truly show the beauty of these pear shaped stones. 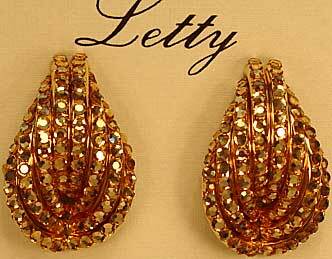 Set in a rose goldtone/copper colored setting, the huge pear stones are surrounded by small clear rhinestones, with more rhinestones on the top section. Pierced, french hook findings, the earrings are 2" x 15/16". Really dynamic looking. 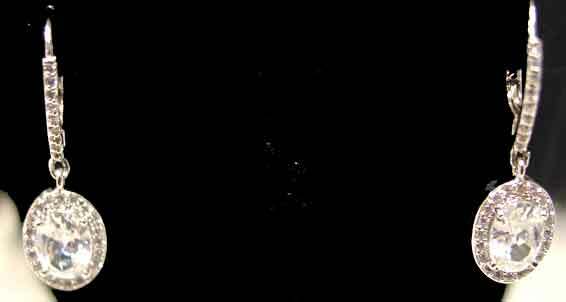 (The spots on the pear stones that you see in the picture are light reflections and are not there in person.) These would go nicely with OB3-746, our peach and clear rhinestone stretch bracelet. 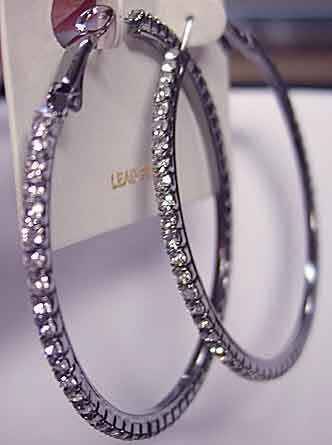 Description: Rhinestone Hoops in a Hematone Setting - Darkened silvertone hoops with clear rhinestones; omega style pierced mechanism. At 2 1/8" inner diameter these are a larger hoop. About 1/8th" wide. 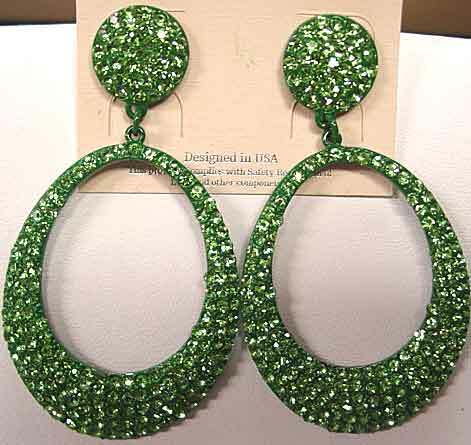 Description: Lime Green Doorknocker Hoops - Elongated hoops set with peridot colored rhinestones, in a darker green setting. Tops and bottoms are all pave set. Pierced (post), 2 1/2" x not quite 1 1/2". Very sparkly in person. From Sassy South. 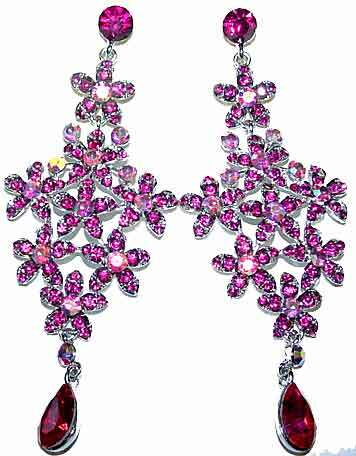 Description: Fuchsia/Pink AB/Dark Pink Rhinestone Earrings - At 3 3/4" x 1 1/2" this is quite a showy earring, but the openess of the floral design makes it feel more delicate than it would otherwise.The flowers are set with fuchsia rhinestones and centered with a single pink AB rhinestone. The very top stone is fuchsia, while the bottom dangling pear is a dark pink. All paste set in silvertone, pierced (post). Fuchsia has been a strong fashion color this year. 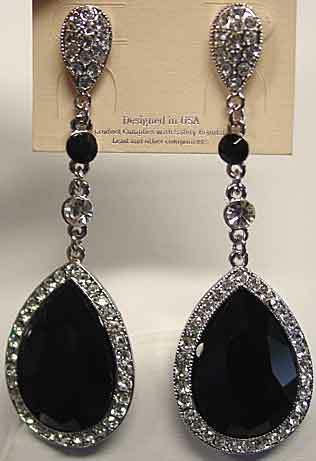 Description: Pageant Style Black and Clear Rhinestone Earrings - A classic style done in an oversized version sure to attract attention. Sparkling black pears are surrounded with a border of paste set clear rhinestones, dangling from a pave set top and a stone set chain in black and clear. 3 1/4" long, bottom section is slightly over 1" at widest point. Pierced (post), silvertone. From Sassy South. 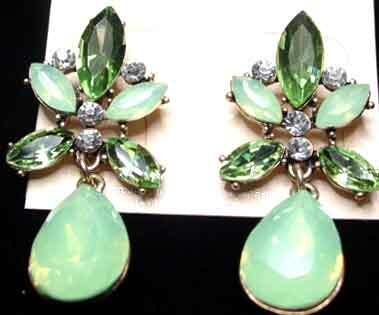 Description: Lime Green and Aurora Borealis Rivoli Waterfall Earrings - Whether you are competing in a pageant or just wanting something to make you feel glamorous wherever you are, here is a great pair of earrings. 3 1/2" x 7/8" at the widest point, all stones are rivoli cut except for the smallest rounds (4 on each earring). Wonderfully sparkly! Pierced, silvertone setting. 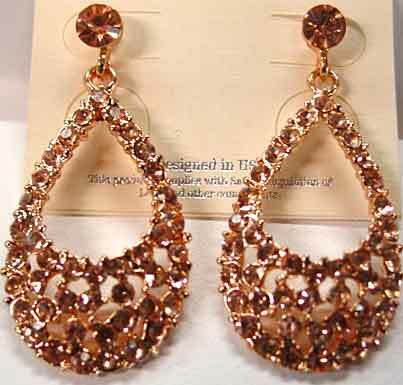 Description: Sassy South Peach Rhinestone Doorknocker Earrings - A nice go-with for OB3-746, these are not a match, per se, because the earrings setting is goldtone and they are entirely done in peach rhinestone. Pierced, with doorknocker part dangling from a single peach rhinestone. A very wearable size at 1 3/4" x 7/8". 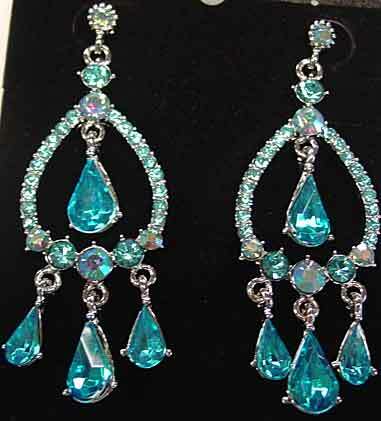 Description: Sassy South Chandelier Earrings in Deep Aqua/Aqua AB - Vibrant dangling pear rhinestones in intense aqua are highlighted with aqua and aqua aurora borealis rounds. 2 3/4" x 1" at widest point. Silvertone, pierced. Description: Sassy South Chandelier Earrings in Vitrail Medium and Clear Rhinestones - Vitrail (watermelon colored) dangling pears are accented with clear rhinestones. 2 3/4" x 1" at widest point. Silvertone, pierced, lead and nickel free. We are happy to have these back in stock! 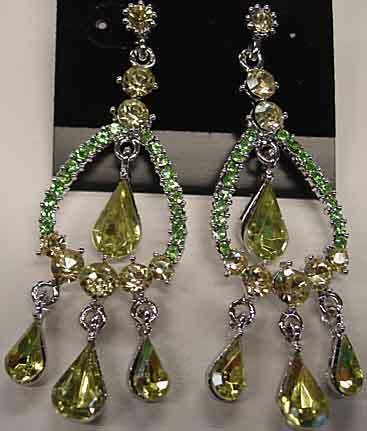 Description: Sassy South Chandelier Earrings in Lime and Jonquil Rhinestones - Dangling yellow pear shaped rhinestones are accented with lime green (peridot colored) rhinestones. 2 3/4" x 1" at widest point. Silvertone, pierced, lead and nickel free. A very contemporary and popular color combination! 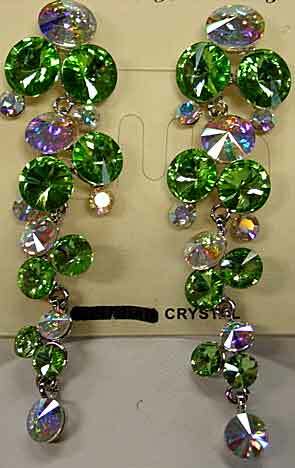 Description: Green Faux Opal Rhinestone Dangle Earrings - While light green has been popular for a number of years, it is usually lime green that you find. Here is a pair of earrings in a softer, minty green that has only been available for a short time. 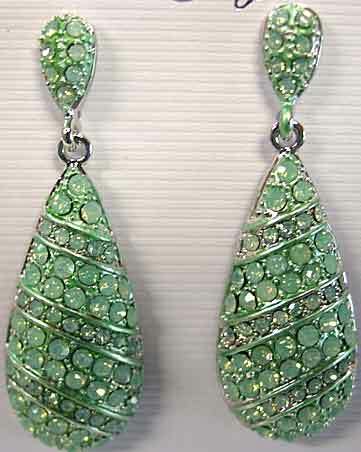 These stones are translucent and are set in silvertone that has a very light wash of soft green enamel. Pierced, silvertone, 2 1/4" x 3/4" and the metal is domed, rather than flat, for a nice 3-D effect. Hard to find color and quite sparkly! Lead and nickel free. 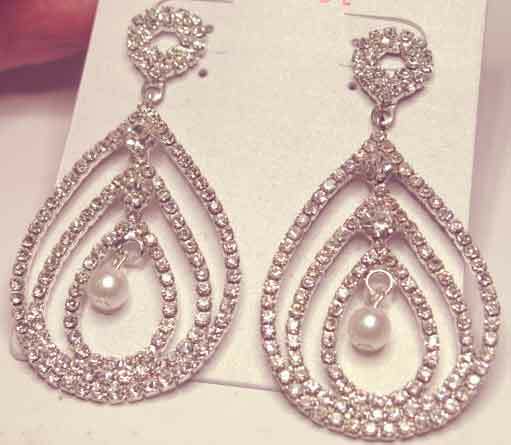 Description: Micro Pave CZ Elongated Doorknocker Earrings - Another very elegant look, whether you are a member of the bridal party, going to a special event, or simply for a night at the theatre or a great restaurant. Pierced (post), 1 5/8" x 7/16" at widest point. Uptown girl, these are for you! Description: Pear "Halo" Cubic Zirconia Earrings - Pear shaped dangle earrings have been the darling of the fashion world of late, and this "halo" style is another variation on this theme. The large pear dangle is surrounded by an open teardrop bordered with a row of small cubic zirconias, dangling from a pave set teardrop top. Pierced (post), silvertone, 1 1/8" x 9/16" at widest point. 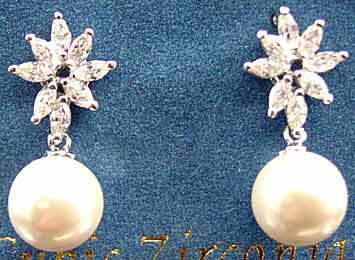 Description: Glass Pearl and Cubic Zirconia Dangle Earrings - Floral inspired tops in clear CZ navettes surmount a round white glass pearl, about 3/8" (10mm) in diameter. 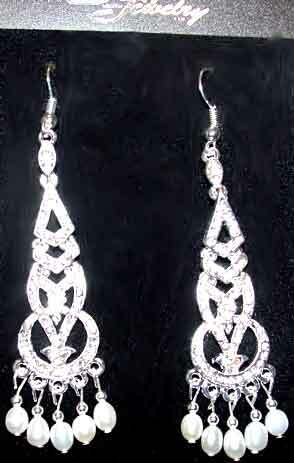 Similar to a pair of earrings seen on a Hollywood actress in a fashion shoot for a major magazine. About 1" long. 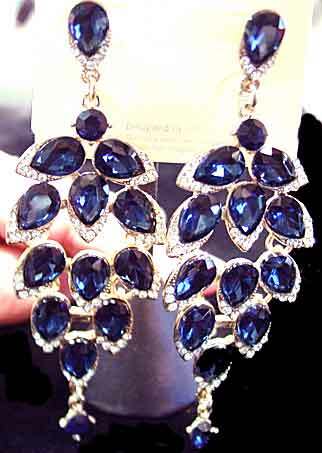 Description: Sapphire Rhinestone Chain Dangle Earrings - At 4" x 3/4" these sound like they might be heavy, but the use of small chain and stones make these a breeze to wear, and somewhat delicate looking even for their size. All stones are prong set, silvertone setting, pierced. Beautiful color, great price and fun to wear. Description: Vitrail Light Button Earrings - Simple rivoli cuts in a most unusual color, these combine lavender with a light grey flash. A color that you come across rarely, these are 5/8" in diameter, with no setting color that can be seen when worn (findings are silvertone). For pierced ears. Description: Pink and Pastel Rhinestones Earrings - These are set in goldtone and are unusual in that the goldtone metal frames have been pave set with jonquil rhinestones, making the frames appear to twinkle without it being really obvious, in person, that they are all stone set. 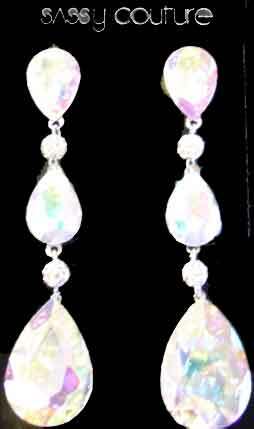 Large, beautiful pink teardrops are accented with light blue, lime green and lavender rhinestones at the bottom, and a single pink rhinestone at the top. Pierced, 2 1/4" x 3/4". If you love pink these are for you! 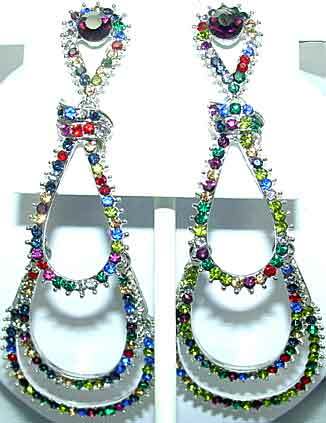 Description: Multi Jeweltone Rhinestone Tiered Earrings - These earrings use many small colored rhinestones in red, sapphire blue, olive green, purple, emerald green, light Colorado topaz, and even black diamond. 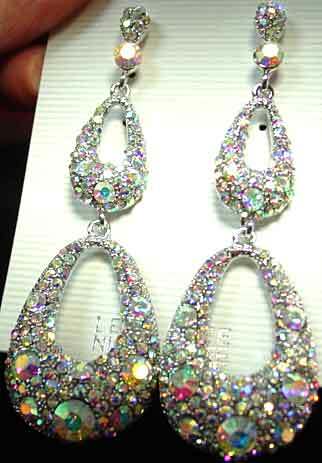 The larger rhinestone at the top of each earring is purple. Silvertone setting, pierced, quite lightweight. 3 1/2" x 1 1/4" at the widest point. These should go nicely with almost any dark colored clothing. 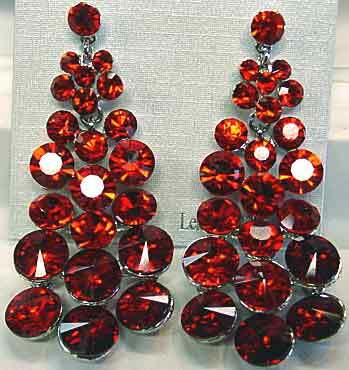 Description: Dramatic Red Rivoli/Chaton Cascade Earrings - The largest stones at the bottom of the earrings are rivolis(pointed top) with the rest of the stones standard chaton cut. Color is light siam, a red with just a touch of orange. Silvertone setting, pierced (post). 2 1/2" long, about 1 1/8" wide across the bottom. 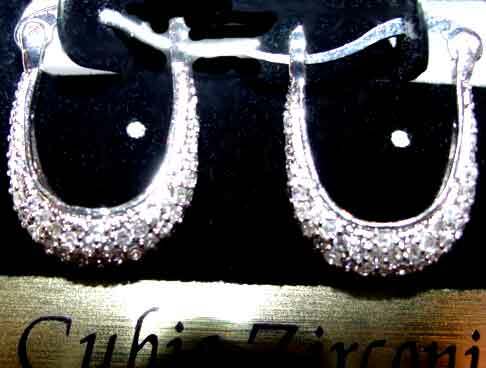 Description: Elegant Clear CZ Trillion Cut Hoop Earrings - Trillions are basically fancy cut triangular stones. 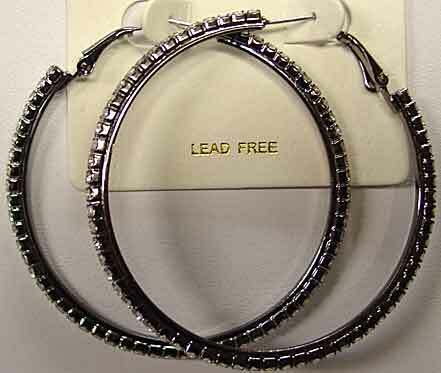 Here they alternate around the front side of silvertone demi hoops. Pierced, 7/8" in diameter, about 1/8" wide. Perfect for the bride or one of the moms, or for anyone wanting something for a special dinner out. Description: Multi Turquoise/Emerald Floral Earrings - These lovely earrings use light, medium, and dark aqua rhinestones on everything except the flower petals, which are emerald green/teal. Pierced, silvertone setting, and quite streamlined at 3" long and 7/8" at the widest point. 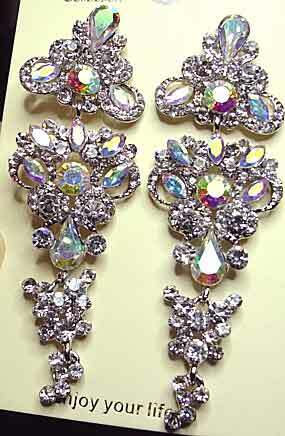 Pretty not only for a formal occasion but fine whenever you need some fun earrings. Put these on with a cute top and your favorite jeans and party hardy. From Sassy South. 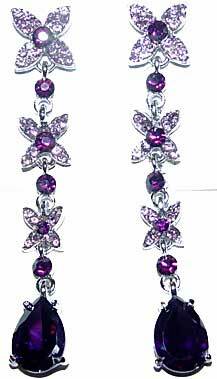 Description: Multi Purple Rhinestone Earrings - These floral motif earrings have leaves that are set with lavender rhinestones, while the center stones and the link stones are purple. The large pears at the bottom of the earrings are deep purple. Long and slender at 2 3/4" x 1/2", and the articulated links make these dangle nicely. Pierced, silvertone setting. 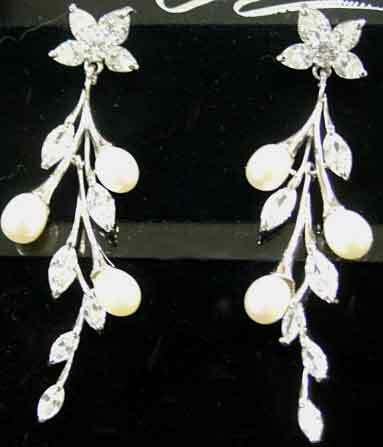 Description: Freshwater Pearl and CZ Dangle Earrings - Graceful pearl and cubic zirconia "branches" dangle from cubic zirconia half fleurettes of marquise, pear and round stones. Silvertone setting, pierced. About 2 1/2" long, slightly over 5/8" at widest point. Price given is for the earrings only, however we have pictured them with OB5-567 so you can see how well they look together. 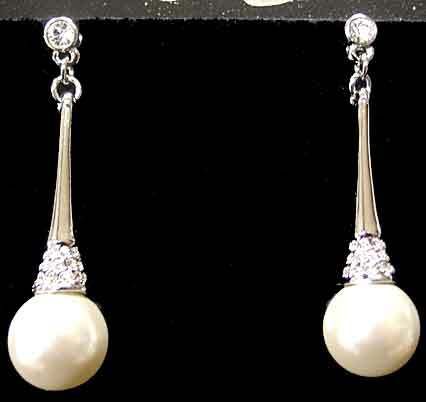 Description: Elegant Deco Inspired Earrings with Freshwater Pearls and CZ's - Long and narrow, with the freshwater pearl being the widest point of the earring, these are sophisticated and understated. The oblong freshwater pearl is capped with a stone-set beadcap, which dangles from a stone set "tie", which hangs from a single prong set CZ. Pierced, silvertone, 2 1/8" x 1/4". Beautiful! 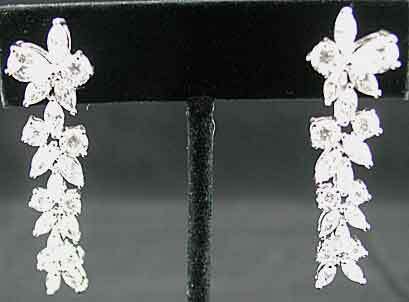 Description: CZ Floral Dangle Earrings - These were so sparkly that my camera got "confused" - you will need to see these in person to see how dazzling they are. At 2" x 1/2" at the widest point, these are elegant but still can be seen at public events or in photographs, perfect for the bride/bridal party, pageants, fundraisers or just out for the evening. Done with pear, marquise and round cubic zirconias in a silvertone setting, pierced. Even if you buy these just to look at in your jewelry box, you won't be disappointed. 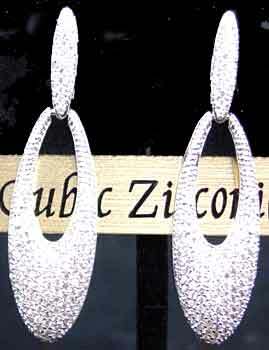 Description: Sterling Silver Pave Set CZ Demi Hoop Earrings - Rhodium plated for little if any future upkeep. These are unusual in that not only the front is pave set but the sides as well, so these sparkle no matter what angle they are seen from. Pierced, 5/16" wide, 5/8" in diameter. Large enough to be seen but not too large. These would work for not only a special occasion but out to dinner or theatre, or even to some work settings. 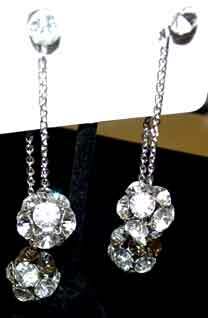 Description: Front and Back Rhinestone Ball dangle Earrings - Clever designs allows both chains to dangle freely, ending with 1/2" (13mm) clear rhinestone balls. Silvertone chain, shorter dangle is 2 3/8", longer dangle is about 3 1/2". 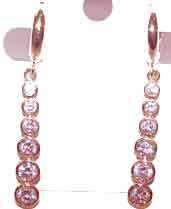 Longer back dangle is suspended from the earring nut (clasp), while front shorter dangle hangs from a single 5mm clear rhinestone. For pierced ears. 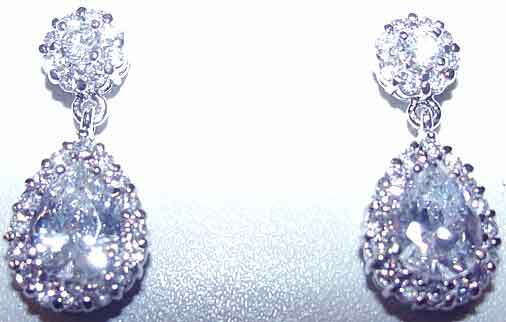 Description: Clear CZ Set Hoop Earrings - Elegance personified, with small cz's pave set over the entire earring. Silvertone rhodiumized finish, pierced with tongue and harp clasps. 3/16" wide at widest point, 5/8" long and 1/2" deep. For anytime you need a refined, classic look. Description: Clear Cubic Zirconia Pear Double Drop Earrings - Pierced, tops are pave set with tiny clears, from which suspends a smaller pear-shaped CZ, and then a larger pear-shaped CZ. 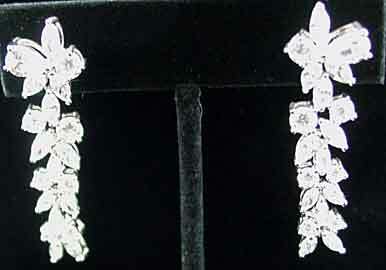 Beautifully sparkly, these look very elegant and "real" - perfect for a wedding and anytime you want to look special. 1 1/2" x 5/16" at widest point. Silvertone setting. Description: Animal Print Demi Hoops in Black Enamel and Clear Rhinestones - Left hand pair are silvertone setting, right hand pair are goldtone. These actually came from different wholesalers, and while they are almost identical, the silvertone pair seems to be slightly longer (1" x 5/16") than the goldtone pair ( 7/8" x 5/16"). Both are pierced. Price separately. Description: Jonquil and Clear Rhinestone Earrings - Classic design with a yellow colored pear shaped stone surrounded by clears, dangling from a clear rhinestone fleurette. Silvertone setting, about 1 1/2" x 3/4" at widest point. Pierced. 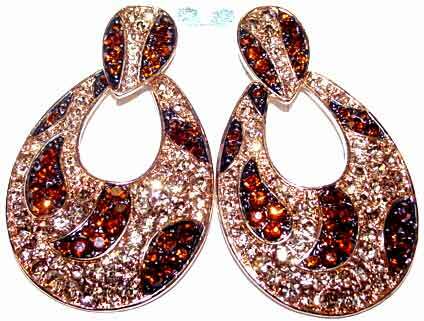 Description: "Animal Print" Rhinestone Doorknocker Earrings - A larger size at 2 1/4" x 1 3/8", these use light Colorado topaz and smoky topaz rhinestones, set in goldtone. Pierced. Lots of fun! 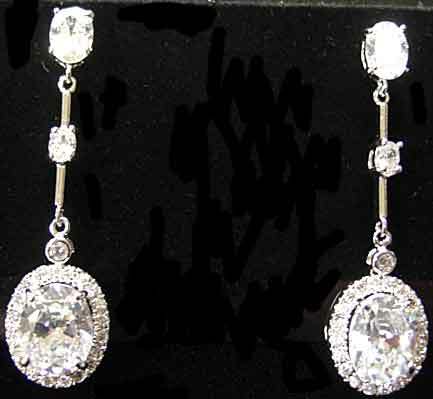 Description: Cubic Zirconia Oval Dangle Earrings - Very similar to OE2-357, these use a 6 x 8 mm oval clear cz surrounded by small rounds which also go up the front of the lever back finding. About 1 1/4" long. Rhodium type plating over base metal, for pierced ears. Description: Clear Cubic Zirconia Drop Earrings - Six slightly graduated round CZs drop from a small goldtone hoop with a clicking clasp. About 1 1/2" long. Classic styling that is flattering to almost anyone. For pierced ears. Description: Cubic Zirconia Pear Bordered Dangle Earrings - A classic design for brides throughout the years, these use a 6x8mm cz pear surrounded by a line of tiny rounds, suspended from a round cz surrounded by more tiny rounds. Silvertone, pierced (post), 7/8" x 3/8". Again, these look like the real thing but at a fraction of the price. 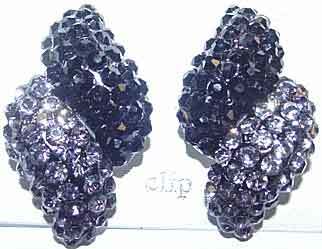 Description: Jet Black and Black Diamond Rhinestone Pave CLIP Earrings - 1 1/2" long x 7/8", set in silvertone, with an enamel wash matching the stone color. Much sparklier in person, these black diamond rhinestones again have an almost lavender cast to them in certain lights. 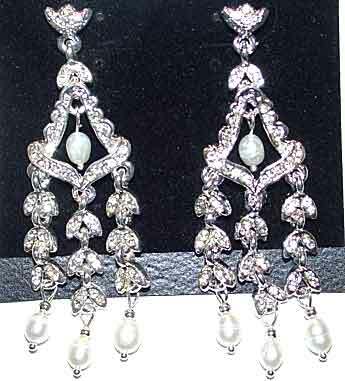 Description: Sassy South Rhinestone & Pearl Deco Style Earrings - Delicately beautiful, these still are an intriguing design based on pieces from the 1920's and 30's. French wire findings, about 3" from top of the curve, these silvertone earrings are pave set with small clear rhinestones; from the bottoms dangle 5 glass freshwater pearls. You don't have to save these for a special occasion as they look great with an empire waist top and jeans for a drink out with friends, but we have sold these for bridesmaids with rave reviews (let us know if you need multiples as we can probably special order these). 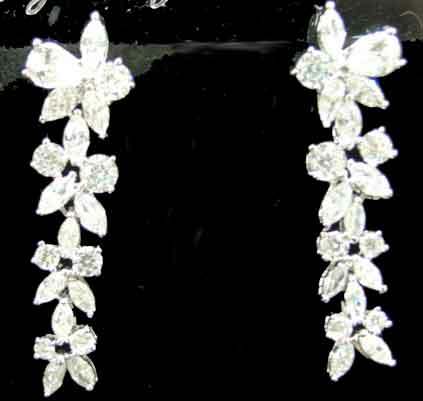 Description: Sassy South Fine Jewelry Look Cubic Zirconia Earrings - These dangling earrings are done in all clear CZ stones, set in silvertone, in a floral motif design. The use of lots of very small stones give these a fine jewelry look, wonderful if your taste runs to elegant and perhaps a little early 20th century feel. Pierced, about 1 5/8" long and 1/2" at the widest point of the "paddle". Perfect for a wedding or any time you want to look well-dressed. Description: Olive Green Rhinestone Chandelier Earrings -Olive green is becoming a popular color in formalwear, and these chandelier style earrings will compliment almost any outfit. 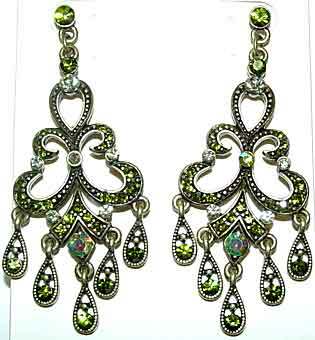 Olive green (olivine) rhinestones are accented with green aurora borealis and jonquil stones, all set in antiqued brass. 2 1/2" x 1", pierced. 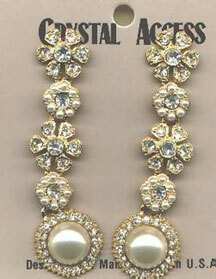 Description: Crystal Access Long Dangle Pearl RS Earrings If more is more in your book, this may be just what you’re looking for. Surprisingly lightweight pierced earrings measure 3" x .875" for diameter of largest segment. Goldtone rhinestone floral motif alternates with a rhinestone surrounded by small seed pearls, with bottom piece being a half pearl surrounded by rhinestones. All pearls are glass, in a light cream. Description: 18th Century French Style Chandelier Earrings with Glass Pearl Dangles - Each of the eight dangles on this pair of earrings is a small pearl, which actually appear to be freshwater, but we are calling them glass as to not infer an inherent value that may not be there. . Along with this is a kind of leaf motif throughout the design. Entirely pave set with tiny clear crystal rhinestones. Pierced, about 2 3/8" x 3/4" at widest points. 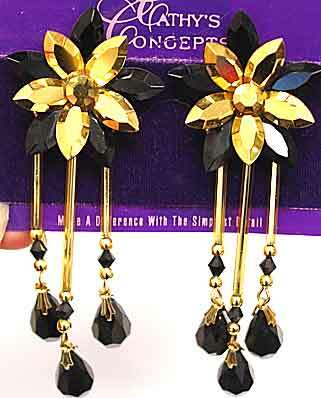 Description: Cathy's Concepts Arum and Black Rhinestone and Bead Earrings - These unusual earrings have a floral motif for the top portion, from which dangle three beaded pendants. Arum is a gold metallic color and is very difficult to find but certainly makes a statement when you do! 3 1/2" x 1 1/4". Clip. 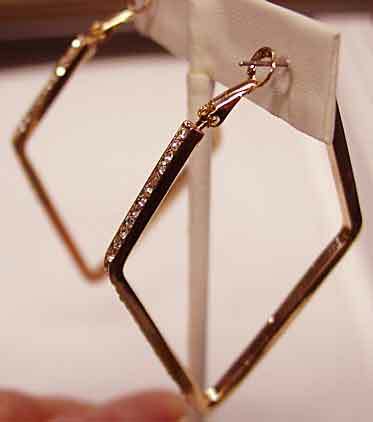 Description: Cathy's Concepts Long Round RS Dangle Earring - Simplicity at it's best. 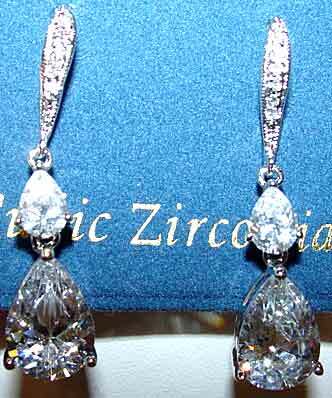 A single clear rhinestone dangles from a silvertone cobra chain suspended from another clear rhinestone. Pierced, 2". Fun with a small pricetag. 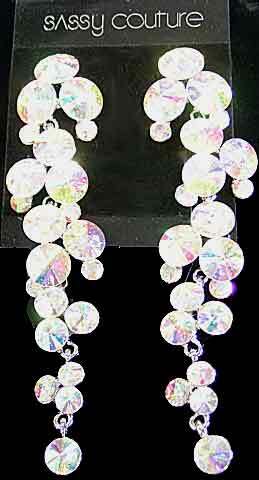 Description: Cathy's Concepts Large Chandelier Earrings - All clear, prong-set rhinestones. 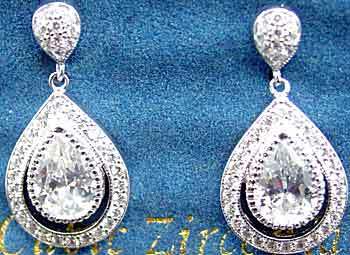 Each dangle terminates with a pear-shaped stones, and the center dangle is a pear as well. All other stones are round. Pierced, silvertone setting. Almost 2 3/4" x 1" at widest points. 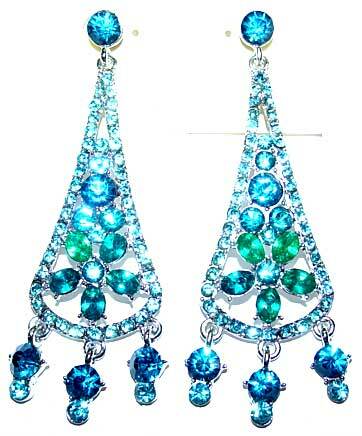 A wonderful, showy earring. 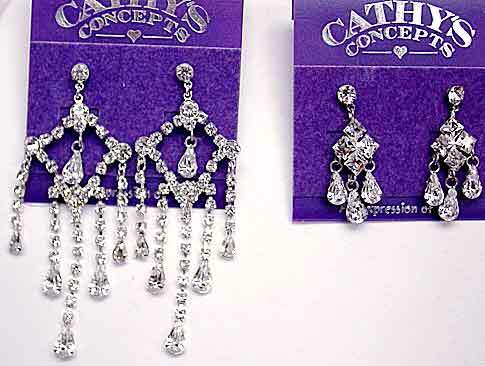 Description: Cathy's Concepts Smaller Chandelier Earrings - A more petite version, this is a very wearable size for almost anyone. 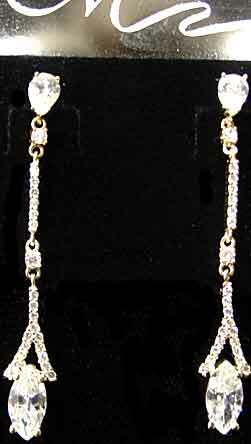 Four square clear rhinestones dangle from a single clear, while three pear shaped clears dangle from the bottom of the central "diamond" shape. All stones are prong set; silvertone, pierced. 1 1/4" x 1/2". A timeless style to enjoy for a long time. 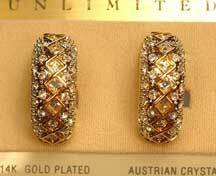 Description: Unlimited Demi Hoops- Very three dimensional and made like fine jewelry. Center line of square and round cut clear crystal rhinestones are outlined by 14K goldplating, remainder of the pieces are rhodium plate with clear pave. Padded clips measure 1.5" x .5" x .75" (deep). You could wear these earrings to the most elegant events and feel that you looked just as expensively dressed as Mrs. Got Rocks. (Probably better). $49.50 and worth every penny. Description: Unlimited Peacock Enamel Earrings - A photo simply does not do justice to the beautiful enamel and pave work on these earrings. Enamel work is a very deep peacock blue. 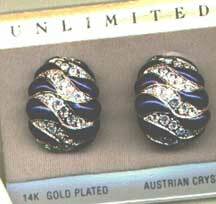 Paved clear rhinestones set in rhodium alternate with the enamel, and sections are outlined in 14K gold plating. Padded clips. Great with a business or dinner suit. 1.25" x .875", domed like a demi-hoop. 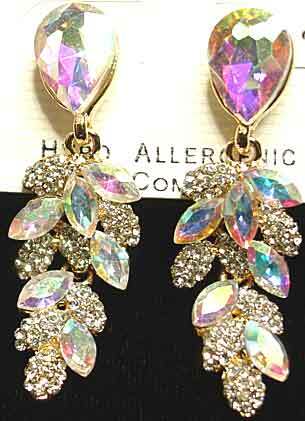 This is a designer style earring without the designer price. 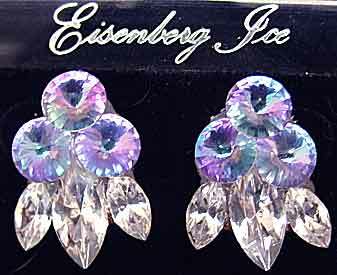 Description: Eisenberg Ice Light Vitrail and Clear Earrings - Light Vitrail is a specialty stone that flashes lavender and aqua. Three rivoli cut stones sit above three clear marquises. Pierced, 1" x 5/8". Expensive, unusual stones that are infrequently found.